To celebrate new library members, you could keep track of every new one visually. One idea was to create a tree on a window and everyone can put up a leaf when they get a new card. What a cool way to show the community how many new members are joining! Another library system took a picture of their county judge showing his library card and used it in advertisements and social media. You can do this with anyone well known in your community -- school principals, the mayor, radio station personalities, etc. -- to catch the eye of nonlibrary users to send them to your library. Add some fun to the children's room! Ask children patrons to show their card for a special library treat, connected to ALA's theme. (i.e. Last year was Snoopy, so they gave out Peppermint Patties.) It was a big hit with the kids! Everyone who signs up for a library card is put into a drawing for gift cards and event passes. You can take this a step further and reach out to patrons who haven't used the library in 3 months and invite them back! When they use their library card, they can also win prizes. 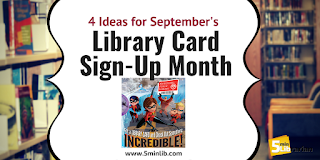 If you have any fun library card sign-up ideas, we'd love to hear them in the comments!